Five hundred years ago, when the Spanish first landed in Florida, the Calusa Indians were the dominant tribe in the state. From Mound Key on the Gulf Coast, their kings collected tribute and exerted influence from Tampa Bay to the Florida Keys. Hernando Fontaneda, a Spanish shipwreck survivor in the 1500s, lived among the Calusa for many years. His memoir is considered the best historical record of a long-forgotten tribe. The Calusa, Fontenada wrote, "in their language signifies a fierce people, they are so-called for being brave and skillful, as in truth they are." The Calusa built mounds and villages from Charlotte Harbor to the Ten Thousand Islands around Everglades City. They were fishermen who used great canoes to travel the Gulf Coast. On Pine Island, they dug a 2-mile-long canal that required moving some 30,000 cubic yards of earth. "These were very accomplished people," says William Marquardt, curator of archaeology at the Florida Natural History Museum in Gainesville. "These were incredible waterworks. The Pine Island canal would have been pretty impressive." The Calusa repelled the Spanish for a century and a half. They fired the arrows that wounded and later killed Ponce de Leon on his second voyage to Florida. They frustrated the efforts of later Spanish missionaries and colonizers. Only when the British began arming northern tribes with muskets were the Calusa killed, sold into slavery and scattered into history. Present-day historians and anthropologists find this a compelling story for students and the general public. "There's an instantaneous connection people can make," says John Worth, a Pine Island researcher who now teaches at the University of West Florida in Pensacola. "The Calusa fished and traded and survived in the exact same environment we use today. They terra-formed this landscape just as modern people have done." For the last century, Pine Island has been one of the sleepiest spots on the Gulf Coast. Why? It has no beaches, which means it has always been more popular with fishermen than developers. Over the last decade, the island has grown. It now has a winter population of more than 10,000. Matlacha, the village at the entrance to the island, has become a small tourist destination with colorful restaurants and art galleries. Archaeology on Pine Island has centered on the far side of the island — Pineland and the Randell Research Center, which was founded in 1996. The Calusa Heritage Trail helps visitors imagine the tribe that once flourished on the Gulf Coast. More serious scholars can dig into a thick new resource from the University Press of Florida. "The Archaeology of Pineland," a 938-page work edited by Marquardt and Karen J. Walker, has 18 authors reviewing 1,700 years of tribal life on Pine Island. Scholars and scientists are not the only ones intrigued by the Calusa. A small army of students and volunteers help with research and education. "It just pulls me in," says Denege Patterson, a retired family therapist from upstate New York. "You pick up a pottery shard and then you realize no one has touched this in 1,000 years. And all these thoughts come flooding in. Who was the last person to touch this? What were they doing? What happened to this site?" Patterson lives on Pine Island and has participated in seven archaeological digs. The more she did, the more training she got, and the more fascinated she became. She also learned the Indian and Spanish history of the island, which she shares on Randell tours. Patterson explains the tricky business of Pineland's original name. The Calusa village on the island was known as Tanpa, which the Spanish called Tampa, but a 1601 map placed this community farther up the Gulf Coast. This map appeared in an important colonial history by Antonio de Herrera. "His name is easy to remember because it sounds like 'error,'" Patterson jokes. "He just got his harbors confused." In 1895, Smithsonian anthropologist Frank Cushing explored a mucky area on Marco Island. Preserved artifacts included fishing nets with wooden floats and clam shell weights. The Calusa fishermen used some of the same knots that anglers use today. Also left behind were painted masks and sculpted figurines, including what is known as the Key Marco Cat. The original buttonwood carving — stored at the Smithsonian Institution in Washington, D.C. — is just 6 inches tall. It shows a kneeling man with the head of a panther. Today this image appears in paintings and sculptures as a beguiling representation of Calusa culture. Merald Clark, a Gainesville artist and archaeology student, wrote his master's thesis on the Key Marco masks. He's also curious about the cat. "I'm personally convinced that it represents a cat-man dancer or performer — like Batman is for us," Clark says. "I think it represents a person wearing a cat costume." The Calusa also created bird and animal masks with lower jaws that hinged, opening and closing mouths. Not quite "The Lion King," as imagined by Disney, but an early Florida effort at animation. Clark imagines these masks being seen by firelight during entertainment or religious ceremonies. His own drawings and illustrations strive to describe daily life on the Gulf Coast 500 years ago. "The Palmetto Palace," a diorama on display at the Florida Museum of Natural History in Gainesville, shows a tribal court receiving visitors. There is a king and queen, shaman and war captain, along with a visiting lord. The meeting room would have been a huge thatched-roof hall that Spanish visitors said would hold 2,000 people. "They are one of the few very complex societies in the world that were based primarily on fishing," Clark says. "A few people fishing can feed everybody." Marquardt, the Gainesville archaeologist, has studied the Calusa for more than two decades. He makes regular trips to Pine Island to speak at the Randell Research Center. He travels with a Power Point presentation loaded on his laptop computer. Marquardt estimates that the Calusa had 50 Gulf Coast villages with perhaps 20,000 people. The tribe ranged all over south Florida and traded goods all over the southeast United States. Their artifacts include quartz from Arkansas and greenstone from the Appalachian Mountains. The Calusa also had gold — but it was gold scavenged from Spanish shipwrecks along the Florida Keys. After 1500, Marquardt believes, Spanish soldiers from Hispaniola and Puerto Rico made voyages to Florida in search of slaves. This helps explain why the Calusa were so wary of Ponce de Leon on his visits to the Gulf Coast. "They already knew," he says, "that the Spanish did not have their best interests at heart." There is still much that archaeologists do not know about the Calusa. Pottery remains are a staple of archaeological research, but tribal relics are of poor quality. When a Randell visitor asks where the Calusa even found clay to make pots, Marquardt smiles and shakes his head. "I would love to know where that clay came from," he says, laughing with his audience. "That has been a thorn in my side for 25 years." Worth spent six years on the Gulf Coast studying the Calusa. He remembers one dig where researchers painstakingly dusted away the centuries until they reached 450 A.D. Finally, he and his colleagues revealed the postholes and fire pit of what had been a small circular hut. "That was a light bulb moment, when we discovered this house," he says. "We were able to tease out a little of their lives, what their homes were like." Worth also studied the documents of Fontaneda, the teen-aged shipwreck survivor who lived 17 years in Florida before returning to Spain. He wrote about everything from Calusa political marriages to a tribal enthusiasm for painting their faces and bodies. After some time, Worth learned to recognize the young man's handwriting. "He's really remarkable, and he's our main source," he says. "Most of our ethnographic insight comes straight from him." Later Spanish missions on the Gulf Coast were unsuccessful, too. The Calusa ridiculed and even "mooned" visiting friars — a Spanish account says hecklers "turned around and showed their buttocks" to the European missionaries. 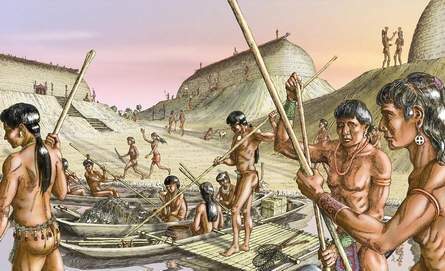 Because the Calusa were fishermen, rather than farmers, they were better able to resist the Spanish than other tribes. When confronted, they could just slip away into the Everglades or Ten Thousand Islands. This is one of the points Worth emphasizes when teaching and talking about the Calusa. They were warriors. They were engineers. They were survivors. "People have this idea that these were a simple people," he says. "They're amazed when they see these images of long houses and fleets of canoes and evidence of a really complex society."